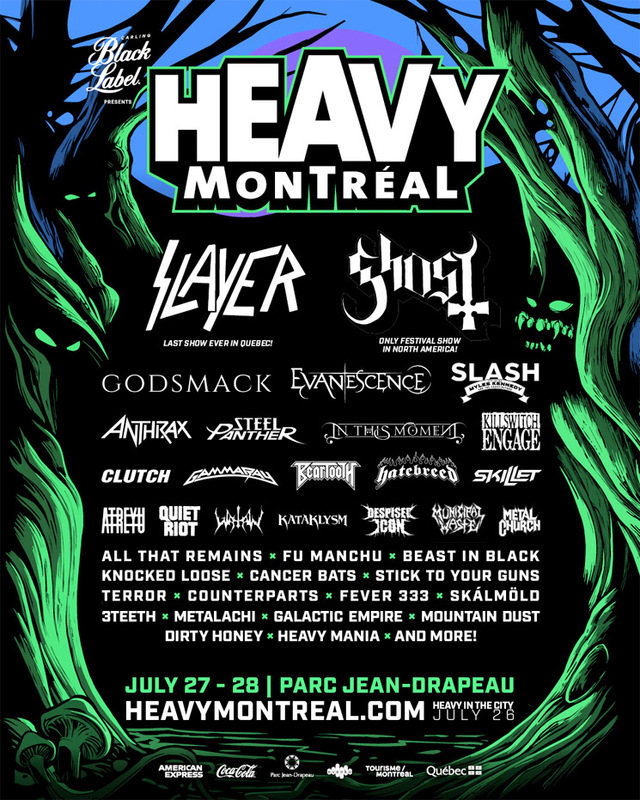 Following Slayer's leak last week, Heavy Montreal has officially confirmed its 2019 lineup. As expected, Slayer lead's the bill, followed closely behind by the likes of Ghost, Godsmack, Evanescence, Slash, Anthrax, Steel Panther, In This Moment, Killswitch Engage, Clutch, Gamma Ray, Beartooth, Hatebreed, Skillet, Atreyu, Quiet Riot, Watain, Kataklysm, Despised Icon, Municipal Waste and Metal Church. Other acts include All That Remains, Fu Manchu, Beast in Black, Knocked Loose, Cancer Bats, Stick to Your Guns, Terror, Counterparts, the Fever 333 and more. Evanescence "My Heart Is Broken"